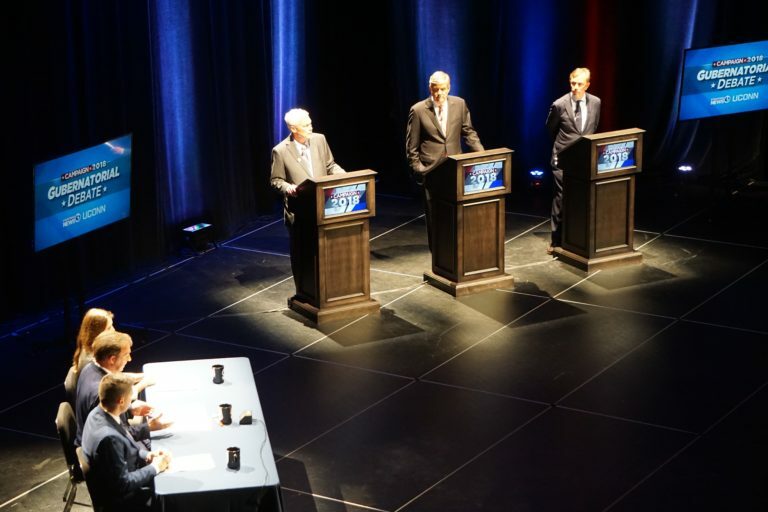 STORRS, Conn. — The presence of a third candidate, Oz Griebel, in a gubernatorial debate Wednesday night did nothing to nudge Republican Bob Stefanowski and Democrat Ned Lamont toward providing details on how they would close a projected deficit of more than $2 billion or finance improvements to a rapidly failing transportation infrastructure. Lamont mocked Stefanowski for his mantra-like answer to any question on the state’s budget or economy: Taxes are too high, Gov. Dannel P. Malloy is to blame, Lamont is the same, and Stefanowski would somehow eliminate the income tax — a proposition that promotes doubt even among Republican voters. Standing before a young audience at the University of Connecticut, Stefanowski said education would be a priority for him. Lamont challenged him to explain how he could support education or anything else when he is proposing to eliminate the source of half the state’s revenue, a loss of more than $10 billion. “If education is a priority for you, and you’re inheriting a $2.5 billion deficit, and you’re going to cut another $11 billion out of the budget — at some point, the numbers just don’t add up,” Lamont said. But neither candidate offered anything even approaching a balance sheet. Lamont said he would make “big structural changes,” primarily by trying to negotiate better drug prices to cut rising health costs. Stefanowski promised to wring $1 billion in waste, fraud and inefficiency from the $20 billion annual budget. Stefanowski said he would issue an executive order declaring a financial emergency his first day in office — an order he conceded would do nothing other than make a statement. “What good is having an emergency if you don’t have a clue what you’re going to do?” Lamont said. On transportation, Stefanowski is opposed to electronic tolling or any other source of new revenue. Griebel said tolls are necessary. Lamont said the only tolls he would impose are on a tractor trailers, a legally questionable levy directed at out-of-state trucks. But Lamont said he was at least putting a proposal on the table that could raise $100 million. The debate was televised live on WFSB. Barring a rise in the polls, Griebel is not expected to be allowed to participate in the final two debates on Oct. 17 and 30. The major-party candidates for lieutenant governor, Republican Joe Markley and Democrat Susan Bysiewicz, are recording a half-hour debate to be aired Thursday night on WFSB. For the first time since becoming a candidate last year, Stefanowski hedged on the subject of Donald J. Trump’s performance as president. In a rapid-fire round, Stefanowski declined to give the president a letter grade, even though he didn’t hesitate to award Trump an A during the Republican primary. Malloy did not fare any better. Lamont gave him an F for failing to push for structural fiscal reforms in his first budget. Stefanowski also gave him an F for seeking two tax increases that he described as the two largest in Connecticut’s history. Stefanowski alone declined to comment on the drama now dominating national politics: Should Brett Kavanaugh, who is accused of an attempted sexual assault while in high school, be confirmed as a justice of the U.S. Supreme Court? Lamont said Kavanaugh did not belong on the court. The post-debate press conferences of the three candidates proved livelier, especially the six-minute, twenty-four second session with Stefanowski. The first-time candidate generally avoids free-wheeling press conferences, where the message discipline that serves him well during debates can make him seem inflexible or unprepared. Questions ignored during the debate could not be so easily deflected backstage. He was pressed again on Kavanaugh. Did he have an opinion about whether the Senate Judiciary Committee was seriously investigating? Yes, I agree Mr. Stefanowski. “We could use some of that economic policy here in Connecticut.” Good way to end a long blurb of blather. The target is Connecticut. Not emotional hyp. The subject is Connecticut, not party politics. In this case, however, the Republican has the correct path to success.